Neel Jani crushed the track record at Sebring Friday during qualifying. 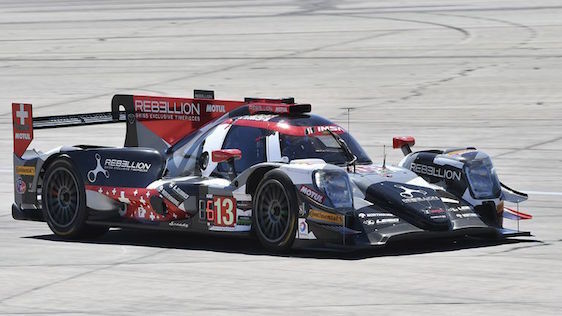 Rebellion Racing’s Neel Jani drove to the overall pole for Saturday’s 12 Hours of Sebring race in Sebring, Fla. on Friday. Jani laid down a track record qualifying lap of 1 minute, 48.178 seconds in the No. 13 ORECA O7 Gibson LMP2 car. Jani said he was a bit surprised by his pole win because of problems the car has been having. The Action Express Cadillac DPi-V.Rs of Christian Fittipaldi and Dane Cameron qualified second and third fastest respectively. In GT Le Mans, the Chip Ganassi Racing Ford GT of Ryan Briscoe won the pole with a time of 1:55.939. Briscoe was just a little quicker than teammate Mueller in the No. 66 – Mueller’s best lap was 1:56.175. The third Ford GT, the No. 68, qualified by Stefan Mucke, was less than a half-second off Briscoe’s pace, but that put him back in fifth. Ford Chip Ganassi Racing brought four Ford GTs to Le Mans and Daytona, but there are only three at Sebring. Qualifying third, with a lap time of 1:56.252, was the No. 4 Corvette Racing C7.R driven by Tommy Milner. But the car was found to have an illegal ride height in post-qualifying inspection, and will have to start last in the GT category behind all GTLM and GT Daytona (GTD) cars. That elevates the fourth-fastest car, the No. 912 Porsche 911 RSR qualified by Kevin Estre at 1:56.319, to third. Surprisingly uncompetitive was the No. 62 Risi Competizione Ferrari 488 qualified by Giancarlo Fisichella with the best lap of 1:57.175, the slowest in the field. The pole in GT Daytona went to Tristan Vautier in the No. 75 Mercedes-AMG GT3 with a time of time of 1:59.738. As in the GTLM class, the top qualifiers in GTD also set a Sebring record. In Prototype Challenge, the pole went to Gustavo Yacaman in the No. 26ORECA FLM09. He had a time of 1:53.506.